This evaluation sought to understand how FHWA’s investment in gusset plate research improved the design and rating of gusset plate bridges. The evaluation team’s primary hypothesis was that FHWA’s R&T activities led to the development, adoption, and application of improved design standards and guidelines for rating gusset plate bridges. A secondary related hypothesis was that FHWA’s R&T activities led to new knowledge of the design and load rating of gusset plates diffused throughout the industry. These hypotheses are discussed in greater length in the Evaluation Findings chapter. Figure 3. High-level logic model. The evaluation focused on FHWA R&T gusset plate investigations, including testing and research done in response to NTSB Recommendation H-08-001, which culminated in 2013 in the adoption of AASHTO standards on gusset plate design and load rating. Initiated in 2009, FHWA conducted research on proper methods to measure corrosion and section loss in inspections of single- and multi-plate gusset plate designs. That research is currently in publication. However, that work is not part of the scope of this evaluation, as preliminary interviews with State department of transportation (DOT) bridge personnel and AASHTO Subcommittee on Bridges and Structures (SCOBS) members indicated it is too early to measure the meaningful effects of this research. [j] State DOTs have varying schedules for bridge inspections and data was unavailable for the evaluation team to gather on recent State bridge inspections and changes resulting from updates to the MBE. The scope of this evaluation is limited to the efforts that led to the eventual adoption of AASHTO’s revised standards for the design and rating of gusset plate bridges. 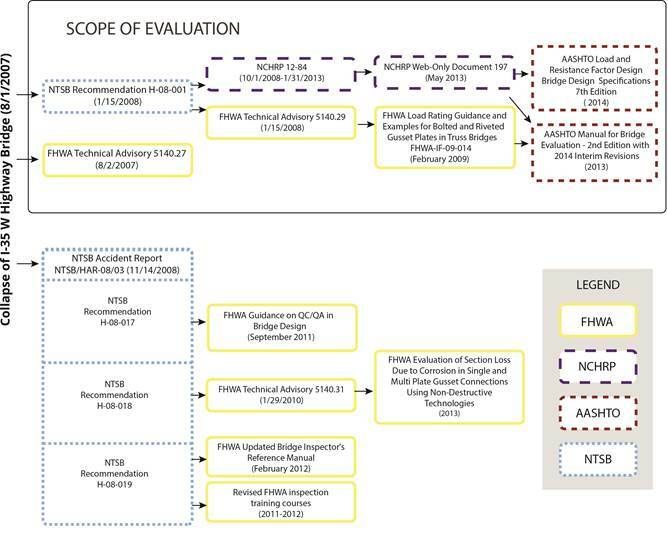 This scope includes a description of how FHWA research helped NTSB identify the cause of the bridge collapse and allowed swift responses from FHWA, NCHRP, and AASHTO to the NTSB recommendations, as shown in figure 4 on the next page. To collect evaluation data, the Volpe team conducted in-depth interviews with key stakeholders and reviewed and analyzed documents from FHWA, NTSB, and a selection of States. Volpe interviewed NTSB investigators on the I–35W Bridge investigation, FHWA engineers, and members and leaders of various Technical Committees of the AASHTO Subcommittee on Bridges and Structures (SCOBS). A list of major stakeholders is included in table 1 below. Three NTSB staff who worked on the I–35W Bridge investigation. Two FHWA staff who worked on the I–35W Bridge investigation and NCHRP Project 12-84. Four current and former members of the AASHTO Committee on Structural Steel Design. How FHWA assisted NTSB with the I–35W Bridge investigation. The extent to which FHWA’s forensic engineering on gusset plates informed NTSB’s recommendations to FHWA and AASHTO in November 2008. How FHWA’s research and calculations led AASHTO to adopt revisions to LRFD BDS on gusset plate designs and MBE specifications for the load rating of gusset plates. Table 2 provides general questions Volpe asked during interviews with FHWA and NTSB stakeholders. FHWA What was your interaction with NTSB leading up to its first set of recommendations, H-08-001, during and following the onsite investigation? FHWA What was the timeline, from idea generation through implementation, for conducting research and eventually publishing the NCHRP report? FHWA What expertise and activities did FHWA contribute to NCHRP Project 12-84 and the final NCHRP WOD 197 report? NTSB After FHWA fulfilled its particular role with the onsite investigation, how did your agencies continue to work together? 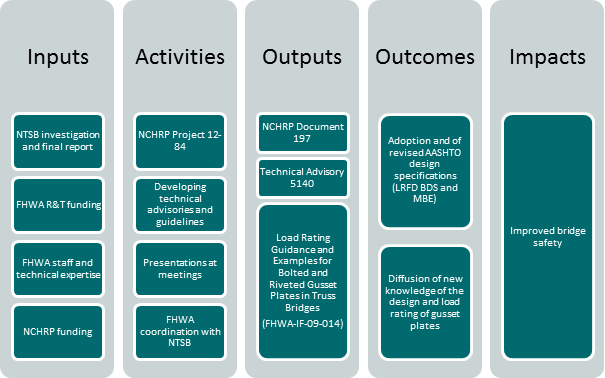 What were the next steps in the process that eventually led to the NCHRP Project 12-84? NTSB What is the process for bridge and highway investigations? Why, when, and how did you involve FHWA in the process? NTSB How did you involve FHWA in the process for developing your recommendations following the I–35W Bridge investigation? NTSB Describe the technical expertise and resources FHWA provided during and after the I–35W Bridge investigation. Accident Report NTSB/HAR-08-03 Collapse of I–35W Highway Bridge Minneapolis, Minnesota August 1, 2007 NTSB Final report presenting the conclusion of the NTSB’s investigation of the I–35W Bridge in Minneapolis. Safety Recommendation H-08-001 NTSB First recommendation from NTSB to FHWA following I–35W Bridge collapse, before the investigation was closed. Safety Recommendation H-08-001 Correspondence between NTSB and FHWA NTSB, FHWA Correspondence between the two agencies regarding the recommendation that FHWA encouraged bridge owners to rate gusset plate load capacity. FHWA Technical Advisory (TA) 5140.29 FHWA Strongly encouraged owners to include gusset plates as part of a load rating, and ensure gusset plate capacity is adequately considered for prior ratings. FHWA-IF-09-014 Load Rating Guidance and Examples For Bolted and Riveted Gusset Plates In Truss Bridges FHWA First publication from FHWA providing specific guidelines to bridge owners in meeting the requirements of FHWA TA 5140.29. NCHRP Web-Only Document 197 Guidelines for the Load and Resistance Factor Design and Rating of Riveted and Bolted Gusset-Plate Connections for Steel Bridges NCHRP Final document with gusset plate load rating specifications that FHWA developed for AASHTO; served to close out NCHRP Project 12-84. Table 3 highlights documents that informed the Volpe’s evaluation. The Volpe team obtained these documents through web searches and correspondence with stakeholders. See appendix C for a complete list of documents the team reviewed. g A logic model is a visual depiction of program components-including inputs, activities, outputs, outcomes, and impacts–that are linked in a chain of causality. It describes the relationship between program resources, planned activities, and expected results. It is not meant to be a comprehensive or linear description of all program processes and activities, but rather it explains the theories of change that drive the design of a program and provides relevant hypotheses that can be tested in an evaluation. h These activities were led by different offices within FHWA. i See appendix D for a full description of NTSB's written recommendations for FHWA. j A list of stakeholder interviews, including these preliminary discussions with State DOT bridge personnel and AASHTO SCOBS members, is in appendix E.
k Figure generated by research team. l Stakeholders at four State DOTs were also interviewed prior to a change in the scope of the evaluation. These stakeholders are listed in appendix B.